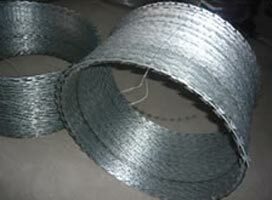 The wedlock of high-tensile steel wire and razor-sharp steel blades results in the birth of a cutting-edge fencing material known as Razor Barbed Tapes. The Razor Barbed Tapes are can be attached in these Welded Fencing Panels to stop aggressive perimeter intruders. This Welded Fencing Panel has Razor Barbed Tapes mounted on its top, making climbing and touching a tedious task.